Jessica Gray – a.k.a. 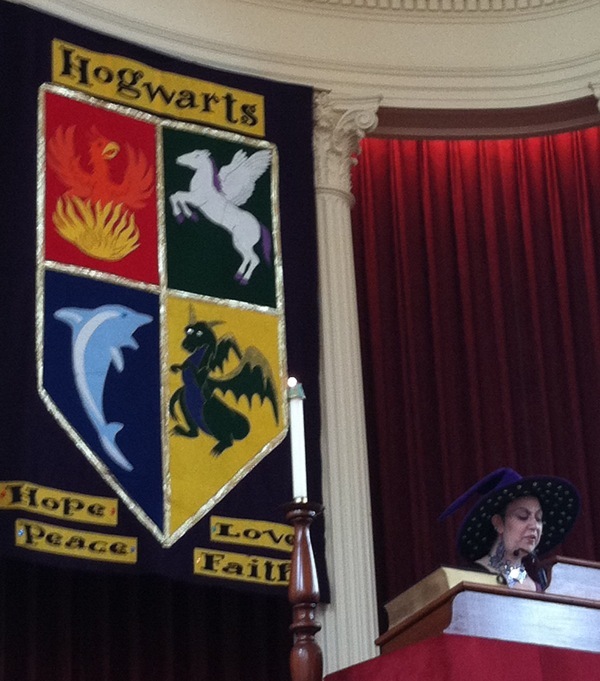 Iris Imaginoria – leads the Harry Potter-themed service. Such was the climactic service of the two-week Harry Potter-inspired “Hogwarts School of Fun and Magic.” Kids from First Unitarian and elsewhere in Worcester participate in the camp, while many of the counselors come from as far away as Baton Rouge, the previous home of Jessica Gray (a.k.a. 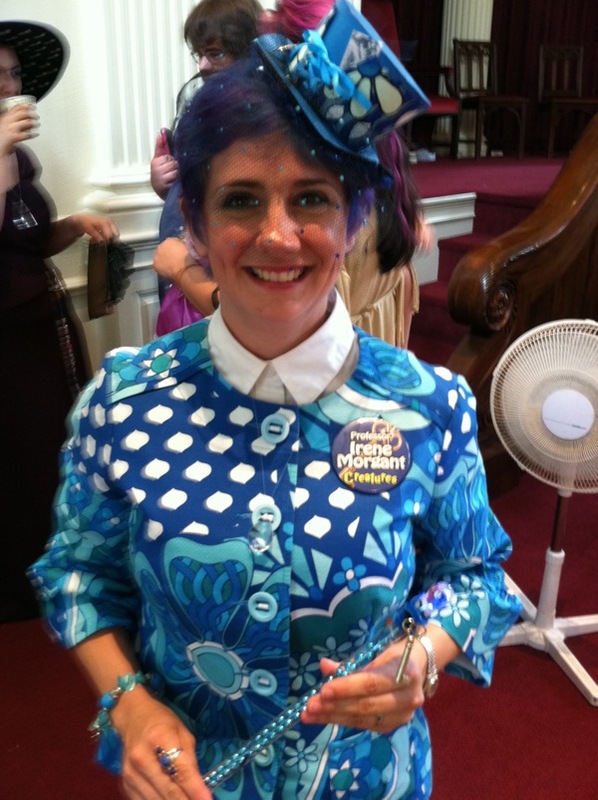 Iris Imaginoria), director of faith development ministries at First Unitarian. Even though I hadn’t read the Harry Potter books, I knew enough from the films to sense how the books could be read as spiritual texts – preoccupied as they are with good and evil, light and darkness, with faith and self-sacrifice. Of course, I also couldn’t resist because, face it, what’s the point of even being Unitarian Universalist if you can’t get a little goofy. Little did I know that for Jessica – excuse me, Iris – the second point folded neatly into the first. When she took the pulpit for her sermon, “Let Your Light Shine,” she referred to humor as one form of light to hold against the darkness. Erin Vignes as Professor Irene Morgant, one of the heads of the house of WaveRider. Nor could I know that among the activities in the church basement turned castle was the assembly of hygiene and school kits for Syrian refugees. What does this have to do with Harry Potter? Only that his creator, J.K. Rowling, worked for Amnesty International in early adulthood; Jessica’s sermon referred to Rowling’s 2008 graduation speech at Harvard University, in which she addressed that period of her life in detail. In that speech, Rowling talked extensively about her experiences at Amnesty, from reading “hastily scribbled letters smuggled out of totalitarian regimes by men and women who were risking imprisonment to inform the outside world of what was happening to them” to seeing “photographs of those who had disappeared without trace, sent to Amnesty by their desperate families and friends.” Many of her co-workers were former political prisoners, living exile, forever scarred by brutal experiences; once walking down an office hallway, she heard a scream; it was the reaction of a young man being told that his mother had been executed in response to his own speaking out against injustice. This continual exposure to the darkness of the all-too-real world informed the moral universe Rowling created for her fantasy hero, the young Harry Potter. As for those who think they’re happier not having to engage such horrors, Rowling doubts that this is so. “I might be tempted to envy people who can live that way, except that I do not think they have any fewer nightmares than I do. Choosing to live in narrow spaces leads to a form of mental agoraphobia, and that brings its own terrors. I think the wilfully unimaginative see more monsters. They are often more afraid.” Whereas her Harry, of course, takes on the monsters, using his light – and more than a little faith – to beat back the darkness. The Muggles amongst us, meanwhile, need not worry; they don’t need a wand to follow this link to Amnesty International USA. And for further inspiration, try the video of Rowling’s eloquent, witty, and, of course moving speech. 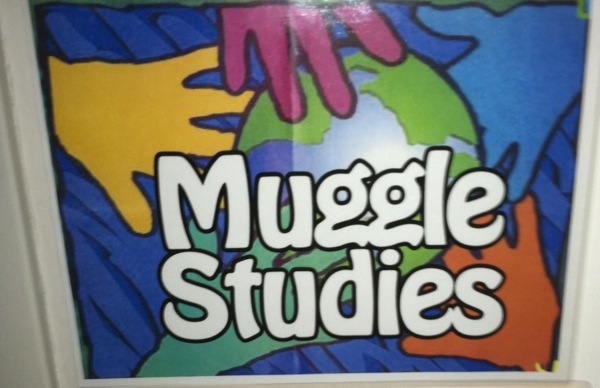 Classroom sign in the basement “castle” at Hogwarts camp.